Home / Football / Personalities / In McMenemy We Trust! Although the scoreboard at the end of the 90 minutes flashed Philippines 0 Myanmar 0, the more accurate score should have been Woodwork 3 Philippines 0. For those of you who are only just starting to discover the beautiful game, the term “woodwork” refers to the frame of the goal, a throwback to a long-gone era when goals were made of wood. But let me digress no more because this is about last night’s match and the fact that – pinch me! 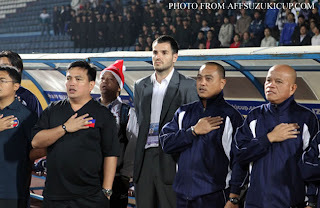 – despite the stalemate, we are for the first time in the semi-finals of the AFF Suzuki Cup! If I were to liken watching that game to being in a game show – and bear with me for the metaphor – then it was a certifiable should-I-take-the-money-and-run situation. Should I be content that we beat Vietnam – the defending champion – and leave this game to the gods of football in whatever state of humor they might be; or should I dare hope, sitting at the top of the table momentarily we might have been, that we could actually make it through to the semi-finals? 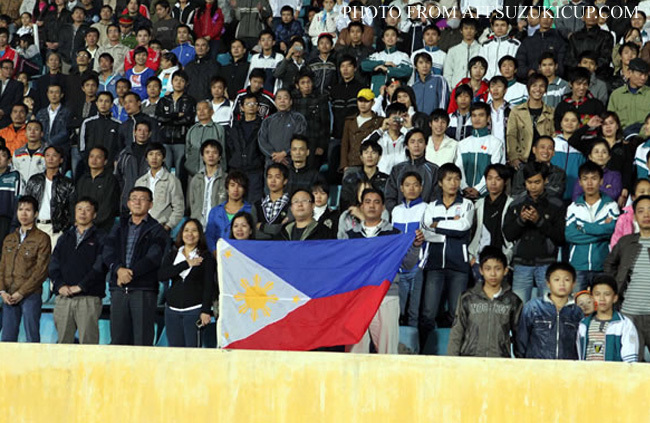 This is just me; but decades of seeing the Philippine National Football Team propping up the rest of Southeast Asia made me wary about actually hoping. Myanmar, after all, was a proverbial banana skin waiting to happen. Although it will long be remembered that Myanmar rolled over and died in their match against Vietnam, what few people talk about is that it was – at one point – actually level with the hosts at 1-all. Its players are technically gifted, fleet-footed and comfortable going forward. At the defensive end, there is a welcome mat for all and sundry. 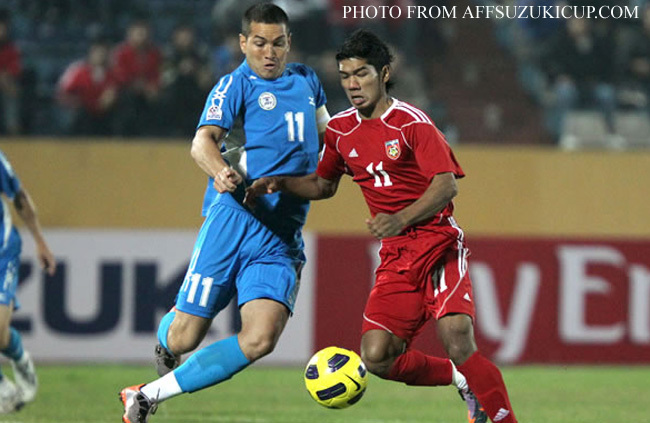 After having seen Myanmar play fluidly in its losing effort against Singapore, I was a tad concerned that our boys – buoyed by that unexpected Vietnam victory – would approach the game gung-ho. I need not have feared. From the kickoff, it was apparent that we would be playing Myanmar with the same counterattacking style that utilizes our boys’ strengths and brought us so much success in the preceding two matches. To the neutrals and the uninitiated, watching the match must have been frightfully monotonous. As the television pundits calculated, Myanmar must have held possession of the ball eighty per cent of the time. I am sure there were those who wondered why we did not have enough of the ball. That – in a nutshell – was the way we set out to play. In other words, that was the game plan. Ball possession and pretty passing do not win games; goals do. To score goals, you have to create chances. Unless the team that has the ball ever contrives to find a way to goal, all the possession is rendered utterly pointless. Precisely why all the square passing at the back between the Myanmar defenders was so hopelessly obvious they might well have planted a sign that read “Come and Get It.” Our boys were having none of it! We stayed back in our own half of the field refusing to be suckered into chasing after the ball; and thus opening up spaces in the middle through which Myanmar could thread its attacks. The neutral must have fretted at the monotony of the proceedings; but I was edified by the discipline that Philippine coach Simon McMenemy had instilled among our players. Not too long ago, we would have chased meaninglessly after the ball. Last night, the whole team – to the last man – was tactically savvy. The transformation has been unbelievable! Lest anyone be misled by all of Myanmar’s possession, the truth of the matter is that of the attempts at goal, ours were the more dangerous. Headers by Phil Younghusband rebounded first off a post and then off the crossbar. Araneta, too, had a shot that hit the post. It makes one wonder what could have been had brisk winds blown at just the right moments. 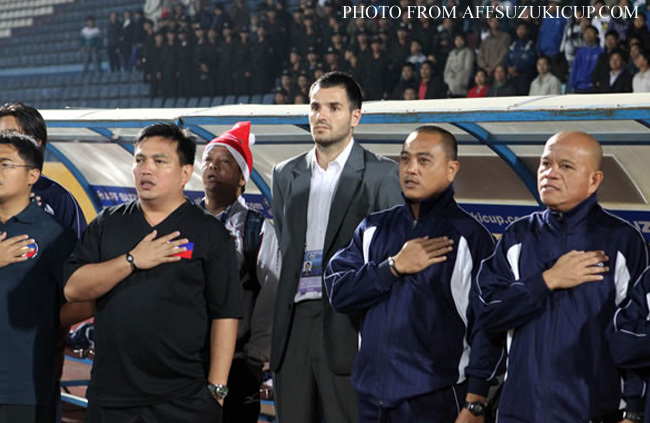 Albeit, the boys were not even at the same level as they were for the Vietnam game. The gait was a tad on the languid side; and there were more spaces at the defensive end that sharper forwards than those Myanmar possessed might have punished. That said, we were on our third match in seven days; we needed a mere point to qualify for the semis; Myanmar was not Vietnam; and nobody gets pumped with adrenaline playing in a half-empty stadium. When Myanmar did manage anything in the way of shots, the calmness with which Neil Etheridge in the Philippine goal collected these was so reassuring; embarrassingly easy, even. How in the world did such a prodigious talent ever end up playing for us? Interesting feller, this Etheridge. Mother originally from Tarlac; attended the Chelsea Academy; signed professional for Fulham; and represented England at schoolboy level. Defenders always feel more secure and, therefore, play more composed if they know they have a good goalkeeper behind them. At six feet and three inches and with a sturdy built, Etheridge may not be so menacing to Europeans; make the Myanmar players stand next to him and they look like Hobbits. 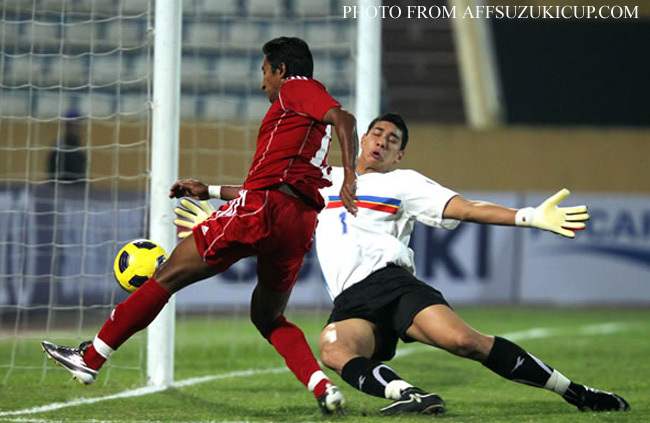 As the pundits on TV correctly pointed out, Etheridge’s arrival has steadied the Philippine team’s defense. They also kept making comparisons with Peter Schmeichel, which should be quite an honor for the youngster; personally, I think he moves a lot like Aussie Mark Schwarzer, the current first-choice goalkeeper at Etheridge’s club Fulham. The fact that Vietnam continued to lead Singapore in the other match that was being played simultaneously made it increasingly apparent that, even on the off-chance that Myanmar could sneak in a cheeky goal, we would still qualify. I was torn between willing the referee to blow his whistle and thus guarantee us 5 precious qualifying points; and willing him to swallow it so we had more time to get a winning goal. Top of our group and our semi-finals opponent was bound to be Malaysia, on paper the lesser threat. Finish second and we end up meeting Indonesia, on current form the team to beat of the four qualifiers. Of course, now that the dust has settled, we know that we are getting Indonesia. No, let me rephrase that. Indonesia now knows that they are getting us! In sport, I continue to be very superstitious, reading omens where – perhaps – there are not even any. Who isn’t? I thought we were lucky against Vietnam and wondered if that luck would balance itself out in the Myanmar game. It probably did; with the three shots that hit the woodwork. Dare I believe those shots rebounded away because there is something else in our favor in the next round of matches? Stranger things have happened… Yet, when I come to think about it, we have already slain one giant; what is to stop us from slaying another? Brandish the sword, Simon McMenemy, Neil Etheridge, Aly Borromeo and the rest of the boys… A whole nation is beginning to rally behind you!